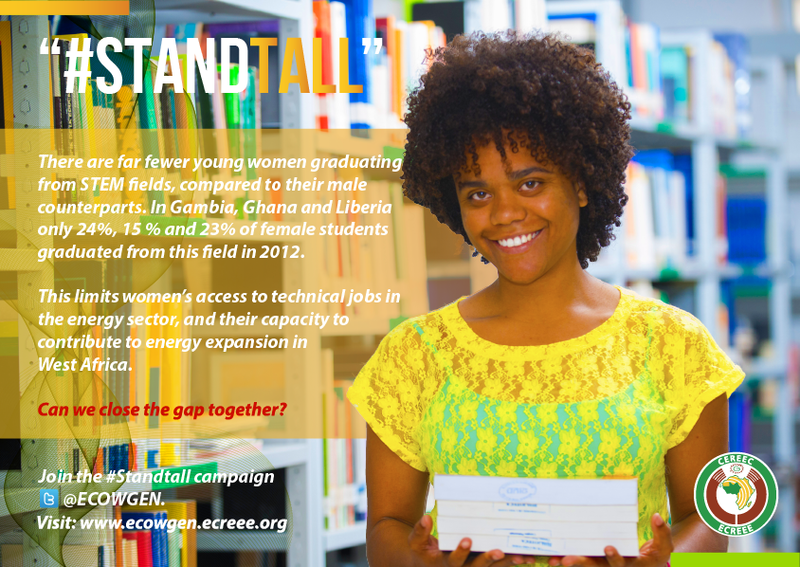 The ECOWAS Centre for Renewable Energy and Energy Efficiency (ECREEE) is launching a global campaign, dubbed “#Standtall” to raise awareness of the under-utilized potential of women in the energy sector. The campaign, which will include an online competition, is being organized in recognition that women are under-represented in the energy sector, particularly in the technical areas. And that an energy sector, where women’s human capital is not appropriately harnessed and utilized cannot achieve the goal of sustainable energy for all (SE4ALL), globally and in the ECOWAS region. For a sector that is STEM (science, technology, engineering and mathematics) driven, on the surface, the reasons why there are fewer women in the sector are easy to trace. For instance, statistics show that compared to the number of males graduating from STEM departments in higher institutions of learning, there are, significantly fewer female graduates. In 2012, the percentage of female students that graduated from STEM fields in the Gambia, Ghana and Liberia were 24%, 15 % and 23%, respectively. ECREEE, and its partners, aim to address these inequalities by tackling the underlying factors behind this; a survey conducted in the region revealed that social norms tend to “allocate” jobs to men and women, with men being the preferred gender for jobs related to technology while administrative-related jobs are assigned to women suggesting that these socially perceived norms hinder women from having the same opportunities as men to a sector that is dynamic and could benefit women in terms of improving their social status and influence in their communities. To raise awareness of and strengthen advocacy on the issue, ECREEE is inviting the public to share articles, photos or video clips of relevance to the subject matter on twitter and on the ECOW-GEN website: www.ecowgen.ecreee.org using the hashtag #Standtall. In addition, the Centre is inviting young women and men (16 to 32 years of age) from the ECOWAS region to participate in its online competition to promote the initiative. recommend, and provide justifications for a solution. Three winners would be selected through a combination of online voting and a jury comprised of six gender and energy experts from ECREEE, the African Development Bank (AfDB), and the Gender and Energy program of the African Renewable Energy and Access (AFREA) program of the World Bank. Winners would be awarded the prize money of $500, $300 and $200 for the first, second and third positions, respectively. Submissions for articles will open on 18 March 2015 and close on 18 April, 2015. Additional information including, the concept note, is available here . Or leave your questions below.